In ways both large and small, Andy Grammer is thinking a lot about how to speak his own truth. The concept of honesty—what it means and how to attain it—offers both inspiration and challenge to one of the most successful pop artists to emerge in recent years. That spirit certainly informs Grammer’s "Give Love," featuring LunchMoney Lewis, from his third album, The Good Parts, which was released on December 1, 2017. "Give Love" follows the success of his platinum hit “Fresh Eyes,” which has racked up over 350 million total streams and became his sixth single certified gold or better. Andy’s new hit single, “Smoke Clears” is out now. “There’s a balance between organic and pop sounds,” he says, “I’ve created my own lane where I don't feel constrained to just serve up shiny, super-produced pop tracks." Even without the aid of a specific genre to categorize himself, Grammer’s music was an immediate sensation, as he became the first male pop star in a decade to reach the Top 10 at Adult Pop Radio with "Keep Your Head Up" and "Fine By Me," from his 2011 self-titled debut. His second album, Magazines or Novels, featured the triple-platinum smash "Honey, I'm Good," which was one of the best-selling songs of 2015, and the certified gold anthem "Good to be Alive (Hallelujah)." Grammer wrote over 100 songs for the new record, and says he was writing and “still trying to beat the best” up until the last minute. (He points out that "Honey, I'm Good" was the last song he wrote for Magazines or Novels.) He has learned that the struggle and the joy come from digging for those lyrics that express an emotion that is both real and resonant. 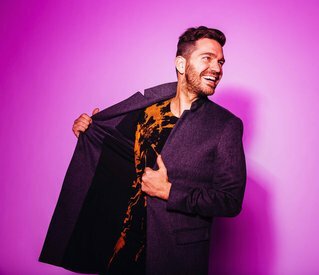 As he continues stacking up hits in a young career, Andy Grammer has learned some things—but not everything—about what it takes to connect with an audience. “I can’t tell you why a song goes huge, but I do know when you’ve uncovered something that’s true,” he says. “We all have emotions and experiences that are true to us, but in the process of getting that into a song it usually crumbles and falls apart. It's kind of like an emotional game of telephone. Once in a while though, an emotion or feeling makes it all the way through the gauntlet and is still totally intact in the form of a song. When that happens, you know it has a chance to go big."